Antarctic Water Fern is a low creeping evergreen ground cover fern for moist shady sites. 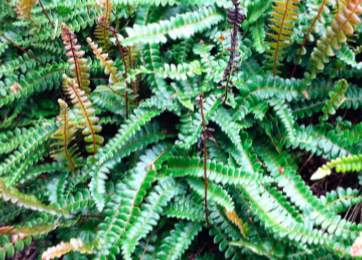 To just 5″ tall the new fronds emerge a bright red before settling to soft green. The pointed finely divided leaves overlap densely creating a cover that blocks weeds. Slowly expands up to 3′-4′ wide when really happy. Rich, moisture retentive soil with regular summer water. Avoid compacted dry clay- does not like. Easy to grow in woodlands, Excellent performance under large shrubs. Avoid hot sun. Good small scale shady ground cover. High deer resistance. Chile.